Since your upper body and core muscles are not involved in the movement, all the possible weaknesses that could affect the squat depth are removed. You can reduce muscle imbalances by training each leg separately. It allows you to change the desired outcome by altering your foot position. A lower foot position targets the quads while a higher position targets your glutes. The hack squat machine provides more stability than other lower-body exercises since you can perform the movement by taking a narrower stance. The hack squat is an excellent exercise if you want to develop your inner thighs, glutes, and the front of the legs. On the other hand, the traditional squat targets your abs, back, and leg muscles, which means it is a total-body workout. Hack squat machine lets you lift heavy loads in a fixed range, and hence it is more suitable for weightlifters and bodybuilders. Traditional squats engage your stabilizer muscles and allow you to work with free weights in a free range. So, it is more suited for athletes and sportspersons. 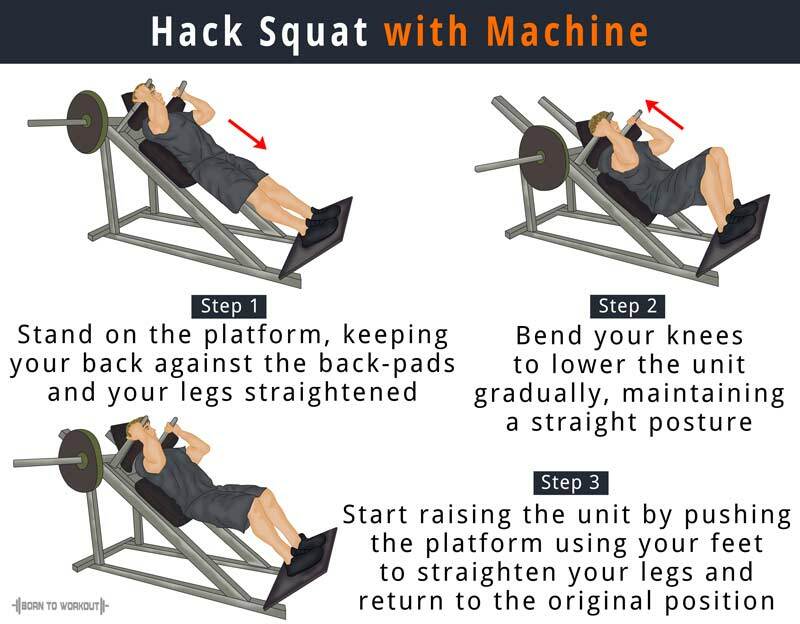 The hack squat not just targets the outer quads but also makes use of your hamstrings, glutes, and calves. Since your hips are bent at an angle of 90 degrees while performing the seated leg press, the involvement of glutes and hamstrings are somewhat restricted. As it primarily targets the inner quads, it is a quad-dominant exercise. Load the hack-squat machine with the recommended weight. Place your back against the back-pad whereas your shoulders below the shoulder-pads. Stand on the platform with a shoulder-width stance and your toes pointed out slightly. Disengage the safety handles by changing the direction of the side bars from the front-facing position to the diagonal position. Straighten your legs and avoid locking your knees. It is your initial position. Bend your knees to lower the unit gradually, and make sure that you hold a straight posture while your head is positioned up against the pad. Start raising the unit by pushing the platform using your feet to straighten your legs and return to the original position. Perform the recommended number of reps.
Make sure your head is always positioned up and your back placed against the pad throughout the exercise. The front of your knees should be perpendicular to the toes, making an imaginary line with them. Your knees will be under a lot of stress if they pass your toes. Thanks a good article. Answered lot of questions. One more question I have is I see people do the hack squat in the reverse manner. What I mean reverse is, instead of the back to the pads, they keep the face to the pads. Also when we move back and keep a wider stance we can go deep on the squat. What are the benefits of this and why do people do this.